Planting a fast growing tree is a great and easy way to give your garden that landscaped look in double quick time. However, it's not all as simple as it seems and there are some things that you aught to be aware of before filling your garden up with saplings that are raring to go. Fast growing plants in general put their energy into lots of prodigious leafy growth and height. This means that they may be weak wooded, have a rather untidy growth pattern or both. There is usually little energy left for flowers or fruit. Fast growth often means greedy feeders with aggressive often shallow roots so frequently little can be grown at the base of these trees (even grass). The longer term answer therefore is to plant some fast growers and then back them up with stronger, long-lived trees that provide elegant architectural shapes, flowers, fruit, bark, autumn colors etc. The trees on this page are labeled Fast, Faster or Fastest, you won't be far off if you assume than growth rate is the opposite of wood strength and particularly - longevity. 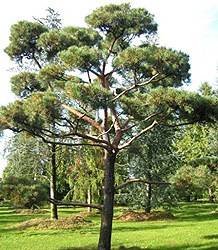 Delivery and planting - These trees are often delivered bare-rooted and dormant. This is so they can be transported through the postal system without paying for a large heavy root ball and its surrounding compost, it also means that any leafy shoots aren't damaged. They may arrive looking like almost bare sticks, but they will grow! Unwrap them and plant as soon as possible, see here for planting technique, make sure you incorporate plenty of organic material in the planting hole when you put them in. Amongst the fastest growing trees in good conditions. Hardy though relatively short lived, expect 30-50 years with any more as a bonus, generally wind, insect and disease resistant. They thrive even in cold conditions. Good for screening. Ensures privacy between houses and serves as a windbreak or fence on farms. Planted 18"' apart they quickly grow into a solid green (deciduous) hedge. Willows or poplars shouldn't be planted within 140 feet of a house or drains to be safe. They have very vigorous far reaching roots and are thirsty enough to make the soil expand and contract with the uptake of water so threatening foundations. One of the fastest-growing trees. Grows as much as eight to ten feet a year under ideal conditions, 2 feet or so is more common. Slender, graceful drooping branches and fine, narrow, leaves that change to a rich golden color in autumn. Handsome bark gives winter interest too. The weeping willow thrives in moist as well as dry locations, frequently growing alongside river banks with a portion of the roots under water which it likes best. Tolerant of smog and smoke. 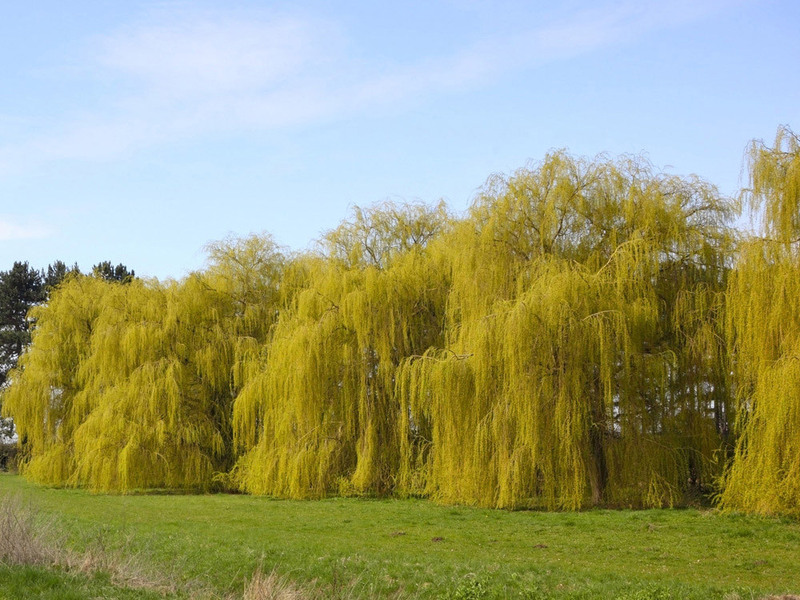 Other willows are also quick growers, though of more characteristic tree shape rather than having the weeping branches. 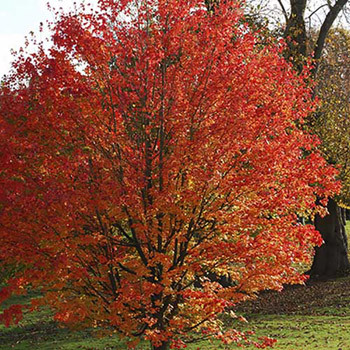 There are a whole host of maples, species and cultivars, they are all pretty fast growers (other than the slow growing Japanese maples) good as windbreak trees. Attractive foliage that frequently turns golden yellow or orange-red in autumn. To 80 feet tall with a 50 foot spread, deciduous. To 40 - 60 feet tall, similar spread with an oval crown. Zones 3 to 9, deciduous. A number of different cultivars are available of the green and white ashes. 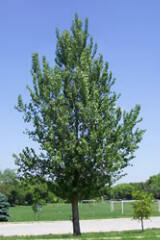 Green Ash tree, Fraxinus pennsylvanica, is a fast growing shade tree with rich green foliage and an upswept branching habit. It is very adaptable. White Ash tree, Fraxinus americana, is a handsome native tree. It develops an open and rather round topped crown in its old age. Excellent specimen trees where the shapely form can best be appreciated. Sometimes sold on the strength of masses of tulip-like flowers in the spring. It's true that they do produce them, though they are not so obvious from a distance their pale green and yellow color blending in with the trees' leaves. The leaves are deep green and turn a blazing golden yellow in autumn. 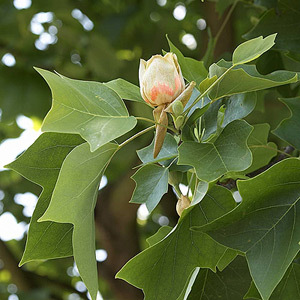 A valuable shade tree Fast-growing, hardy and resistant to insects and diseases. To 80 feet tall, deciduous. Excellent reasonably fast growing evergreen tree. Glistening, steel blue coloring and graceful conical shape. 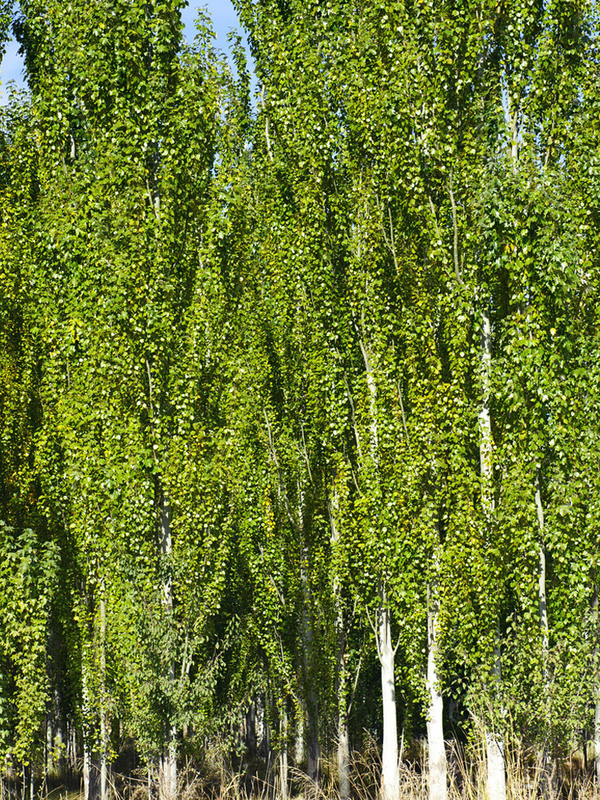 So dense growing these make superb windbreaks or privacy screens where there is space enough for large spreading trees. Makes a great outdoor Christmas tree to festoon with lights. It prefers heavier soils and full sun. 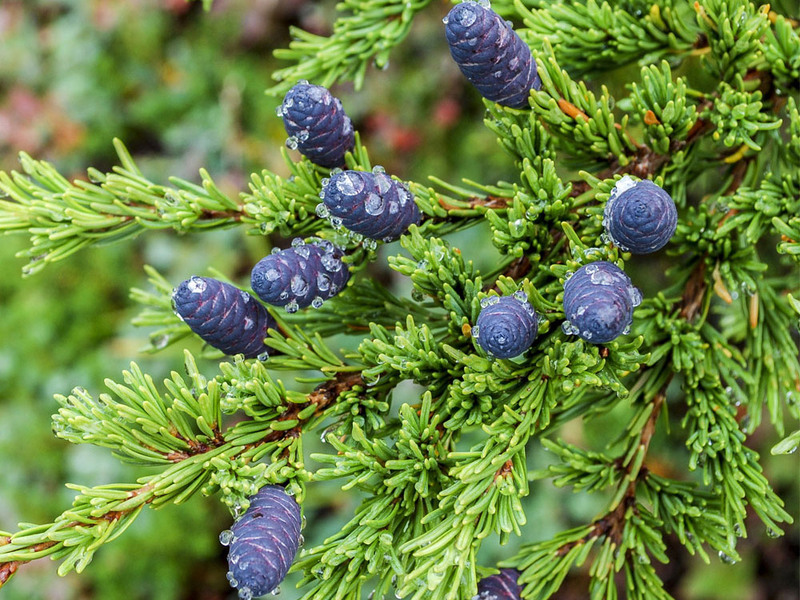 The Canadian Hemlock tree, Tsuga canadensis, is also called Eastern Hemlock or Hemlock spruce. For use as a specimen tree or as an excellent hedge. 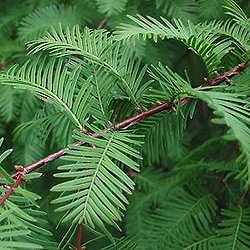 Canadian Hemlock is often called the most graceful of all evergreens. The foliage is a soft blue green color that grows in flat, feathery layers all the way to the ground. It can be cut to any formal shape desired as well as a privet hedge can. Whether sheared, or left unsheared, this hedge remains neat and attractive. Easily adapts to a wide range of soils, requires protection from prevailing winds the first year planted, NOT drought tolerant. Will grow 1-3' annually. To 70 feet tall and 30 foot spread, evergreen. Flourishes in almost any soil or climate, on dry sites growth slows after approx. 30 feet tall, in moist or even damp or waterlogged soils it keeps on going. A handsome narrowly conical specimen tree, plant it, water, and stand back to watch it grow 3 - 6' a year with no spraying, fertilizing, pruning or cutting. From springtime green, the fern-like leaves turn orange-brown to dark brown in the autumn. 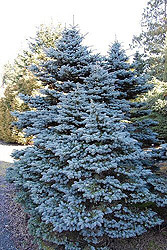 To 70 - 130 feet tall and 15 foot spread or more, evergreen. A magnificent tree, tall and stately, will grow up to 2 feet in a season. Pyramidal when young, then develops to conical to columnar-conical shape. 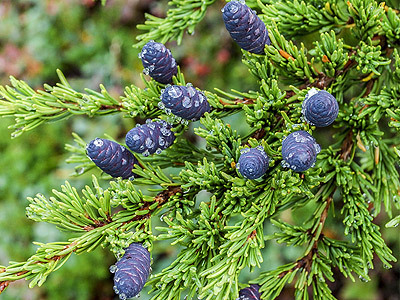 Stiff, bluish-green needles stay dense and thick all year long, blocks wind with a vengeance. 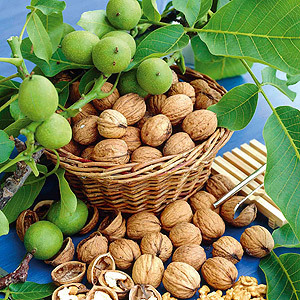 The walnut is a good cropper in climates where summers are suitably long and warm to give the nuts time to ripen properly. It is a good shapely shade tree, not as fast growing as many on this page, but longer lived, sturdier, provides valuable wood and of course plenty of walnuts. To 40 feet tall and wide, deciduous. To maintain a fast growth rate, these trees have to be grown in good conditions. This means no competition around them from other trees or bushes. When planting them use plenty of organic matter to get them off to a good start, clear an area around the tree of grass to a radius of 12-24" (30-60cm) and keep it grass and weed free for the first couple of years. Give them a bucket of water once a week or so during dry spells in the growing season for the first year at least, then once established, they can be left to their own devices.